The Focusrite Blue 315 MK2 Isometric EQ is part of Focusrite’s Blue Range world-class analog mastering range of products. It is actually a heritage product, no longer manufactured or distributed to retail stores by Focusrite and extremely hard to come by. All Blue products are designed to perform to the very high standards established by Focusrite’s legendary analog processors, and provide unparalleled fidelity in mastering, transfer and recording work. The Blue 315, like other Blue Range products, does not feature transformers, since all transformers introduce a slight coloration in the signal path that is usually not desired at the mastering stage. The Blue 315 MK3 is a 4-band parametric equilizer, with an option for shelving in the 1st and 4th bands. Each band has an option to choose between hi & lo frequency as well as having an octave control or Q knob. The gain structure is set at .3 db per click on each EQ’s gain knob. Each frequency on every band is tied to its own circuit, allowing for greater transparency and accuracy in the equalization process. There are also 3 input knobs, each controlling a greater ratio in gain structure. 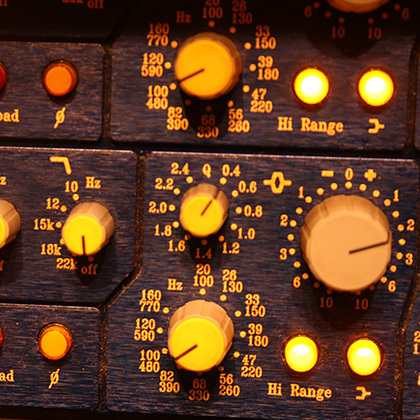 Here at Studio 11, we use the Blue 315 MK3 all the time in our mastering chain. We found that it is great for adding that pleasing layer of shine in the upper frequency spectrum. Some engineers’ talk about how this box can have a tendency to smear sound, but we like a little smearing as it adds smoothness and a little warmth to the overall mix or master. It is especially useful when eq’ing mixes that are printed to tape because of its clean sound. DO YOU WANT THE SOUND OF THE FOCUSRITE BLUE 315 MK2 EQUALIZER ON ONE OF YOUR INDIVIDUAL TRACKS?